Randy cut a pineapple open today with a new cutter we got from pampered chef. Incase you are wondering it really does work. You have to decapitate the pineapple first but then it works just like an apple corer. 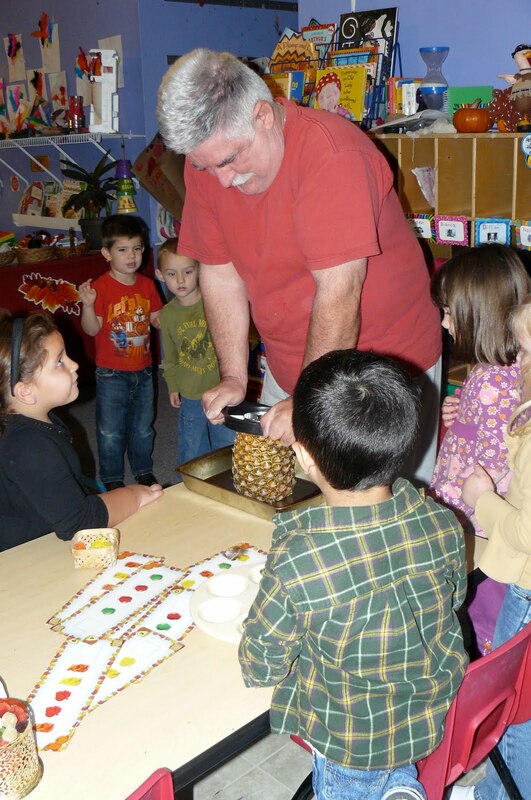 The kiddos will sample that fresh pineapple this afternoon. Moon sand.. oh how they love it. Ellen, Anna’s mom, brought me a recipe for homemade moon sand. I am going to try it and if it works, I will post it for you! Normally I do use the term " Native American " I have used that a LOT this month with the children. My great grandmother was full blooded Cherokee Indian.. and that is how she would have said it. Obviously, I have offended the anonymous poster… I apologize. Hey Ms Debbie. I love the pictures. Looks like they had a blast.. I like the idea of using the bulletin board border instead of construction paper, too! Can't wait to see them.. I like the bulletin board paper too. I've used sentence strips before (turned so the plain side is visible). Love the idea of the border!! We have always used the construction paper or I will tape together the oak tag paper… never good. Great Idea!! We will use it this week!! Thanks so much! !